Volunteers worked on leveling a portion of Brighton’s Daly Field. A deal calls for Simmons College to lease the 7-acre site and build a sports complex there. In a last-ditch appeal, the leaders of two prominent environmental groups have asked the Baker administration to abandon a plan to lease seven acres of park land along the Charles River to a nonprofit group, saying it limits public access and sets a dangerous precedent for the management of protected land. 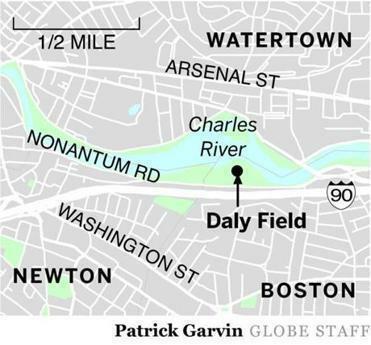 Under the plan, approved by state lawmakers in 2012, Simmons College would spend at least $5 million to build a sports complex at Daly Field, a park in Brighton. Supporters say the renovation would transform the long-neglected property into a neighborhood gem, featuring two new fields, a track, tennis courts, and a river walkway. But George Bachrach, president of the Environmental League of Massachusetts, said the state should not lease such a prime location without a substantial return and should not risk compromising its public use. In a recent letter, Bachrach and Robert Zimmerman Jr., who directs the Charles River Watershed Association, called on the Baker administration to scuttle the agreement. The agreement stipulates that Simmons would have full use of the fields from 5:30 p.m. to 9:30 p.m. on weekdays from March to May and from mid-August to November. Saturdays would be shared by Simmons and the local and abutting communities. Sundays would be reserved for community use. Time would also be set aside for the Brighton High School football team, which once played at the field, and the Allston Brighton Little League. Other groups would reserve the fields through the state’s recreation department, as they do now. The Fenway women’s college would not pay a yearly fee but is required to provide $500,000 for restoration work along the Charles River in Watertown and to maintain the fields for the 20 years of the lease. The lease agreement requires Baker’s approval. The state’s Division of Capital Asset Management and Maintenance is reviewing the deal, a spokesman said. Moran said that while he shares opponents’ philosophical concerns about leasing protected public land, the opportunity to turn a badly neglected park into a brand-new facility was too good to pass up. Simmons College has called on the Baker administration to approve the agreement. In a letter sent Friday, president Helen Drinan said an independent appraisal had determined that Simmons would pay a fair price under the agreement. More than three-quarters of prime-use time at the facility would be open to the public, Drinan said. If approved soon, the fields would open in August 2016. In a separate letter to Baker, Lynda Connolly, president of the nonprofit friends group and a Simmons administrator, criticized opponents for delaying the project at great cost. Read the original article on the Globe’s website.